The State of Florida Association of Police Athletic/Activities Leagues established the Youth Directors Program(YDP) in 1998 after members expressed a need to provide leadership training and a need to involve youth in PAL program decisions. Members of SFAPAL felt it was very important that youth are properly trained so they will be able to improve their lives, and the lives of others in their communities. In the Youth Directors Program special emphasis is put on community service, making your voice heard and earning your way in life. By empowering youth to make decisions, organize projects, and manage their own organization. SFAPAL has tread new ground in youth development. No longer will decisions be made without the input of the youth we are trying to help. The SFAPAL will provide periodic training to each region to help facilitate the development of the Youth Directors Conference. SFAPAL will assist regional directors with community service projects and regional meetings. 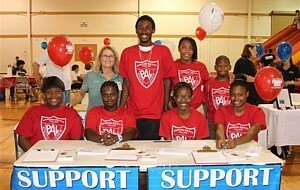 Each participating PAL Chapter must designate an Adult Coordinator for their local Youth Directors Council. Any youth age 11-16 years can participate in the Youth Directors Program. All participants must sign a pledge to be drug alcohol and tobacco free. YDP's (youth directors program) goal is to develop the states largest group of community service volunteers under the guidance of each PAL member chapters' YDP adult coordinator.